While the mainstream press has focused on the decision of the judge in the military courts-martial of Bradley Manning to find him not guilty of aiding the enemy, her conviction of him for 20 other charges amounts to a full-scale assault on democratic rights. The courts-martial now enters the penalty phase. Manning faces a maximum of 136 years behind bars. Whatever the final sentence is, it is widely believed it will be decades in the military stockade. Bradley Manning’s “crime” was to release to WikiLeaks proof of U.S. war crimes in Iraq and Afghanistan as well as many diplomatic cables detailing Washington’s machinations in the Middle East and elsewhere. WikiLeaks then made much of this information available the The New York Times and other publications throughout he world. The release of some of these cables is widely credited with helping to trigger the Arab Spring. Coming down on Manning with an iron fist is part of the government’s drive to severely punish whistle-blowers who leak or publish information about its crimes. It is an indication of what’s in store for Edward Snowden and Julian Assange if they’re ever caught. 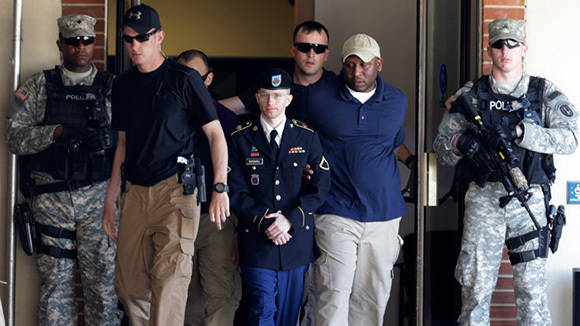 Bradley Manning being escorted out of his trial. Six of the charges Manning was convicted of were violations of the notorious Espionage Act of 1917. These six charges themselves carry a maximum sentence of 60 years. This law was used to go after thousands of IWW and Socialist Party members at the time for their opposition to the First World War, including the conviction of SP leader Eugene Debs. It has become Obama’s favorite club against “leakers.” Before the current administration it was used three times, including against Debs and Daniel Ellsberg for leaking the Pentagon Papers to the press. Now it has been used four more times less than five years. Since the law is called the Espionage Act, one might think that Manning was convicted of spying. But he wasn’t even charged with spying. He was charged with revealing the government’s dirty secrets to the people of the United States and the world. Throughout the military trial, the prosecution repeatedly brought up WikiLeaks and Assange, portraying him as an “information anarchist” who encouraged Manning to leak the classified documents. It is increasingly likely that the government will prosecute Assange as a co-conspirator. That WikiLeaks is a target was emphasized by one of the obscure charges Manning was convicted of, that of “wanton publication.” What was claimed under this charge was that WikiLeaks is not a legitimate journalistic organization. Assange also reported that based on discussions his lawyers in the U.S. have had with the Department of Justice, they “believe that it is more probable than not that there is [already] a sealed indictment” against him. The ongoing case against WikiLeaks is costing between one and two million dollars a year just to maintain the computer systems to monitor its documents. Edward Snowden is of course another target. Now that Russia has granted him political asylum for one year, the White House is fuming, sputtering and threatening. In an attempt to prevent Russia from taking this step, Attorney General Eric Holder sent Russian President Vladimir Putin a letter on July 23. In this letter, Holder promised the U.S. would not seek the death penalty against Snowden, nor would it torture him, if Russia turned him over to the U.S. That Holder had to give such reassurances demonstrates that much of the world believes that the U.S. uses the death penalty too much and that in fact the U.S. does torture people. 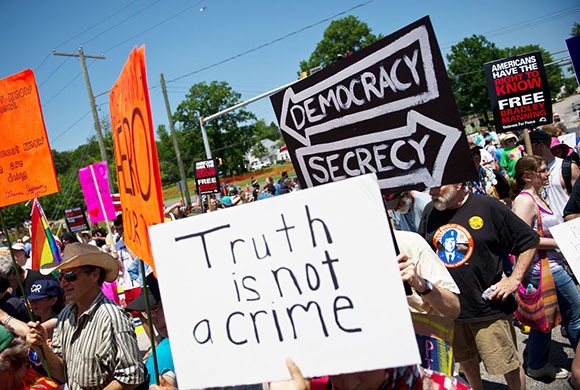 Protestors rally in defense of Bradley Manning and for freedom of information. Incredibly, the White House also attacked Amnesty International and Human Rights Watch for meeting with Snowden, claiming that gave him a “propaganda platform.” While the Manning verdict as a whole is a broadside barrage against free speech, freedom of the press, and the public’s rights to know about government crimes, the finding of “not guilty” concerning the charge of aiding the enemy was positive. The prosecution never brought one shed of evidence forward that Manning’s revelations in fact aided the “enemy,” whomever that term refers to, presumably al-Queda. That’s because there was not a scintilla of such evidence. The government’s sole justification for the charge was that Manning had released material classified as secret to WikiLeaks, which turned it over to the mainstream press, which also published some of it, and thus the “enemy” could read it. Under this reasoning, anyone who released to the press any classified information so that the enemy du jour could read it would be guilty of “aiding the enemy” and be sentenced to life without possibility of parole or death. While the ruling on this charge doesn’t set precedent for Snowden’s or Assange’s cases, it does make it more difficult politically for the government to prove that charge against them.